Looking to maximize your packaging throughput and efficiency? Upgrade your operations with the Wulftec WRTA-200 stretch wrapper. This automatic rotary tower pallet wrap machine features an industrial-strength, 25-inch ring gear with pinion gear drive, heavy-duty steel construction and four-year unlimited cycle warranty. The WRTA-200 not only delivers on safety and efficiency; the durable design prevents load shifting for sturdier end-of-line products. Available performance features include Allen Bradley MicroLogix PLC and AC drives, pneumatically operated cut and wipe-on system and angled carriage with low wrap possibility. 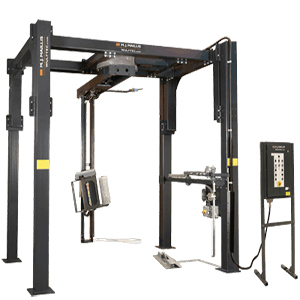 To learn more about the Wulftec WRTA-200 Automatic Rotary Tower Stretch Wrapper, give us a call at (609) 337-3641 or request a quote online. The factory certified support technicians at Hughes Enterprises are available 24/7 to respond to your packaging equipment maintenance requests. Whenever downtime strikes on your packaging line, contact the Hughes support team and a service technician will be on-site within hours to address your needs.